I know, I know – at first glance this wedding looks relatively tame. Aside from the shoes of course, which obviously didn’t result in any sore tootsies for this bridal party — but it has a very unique twist which inspired me to post it. There is nothing I love more than finding a wedding the genuinely reflects the couple. In my opinion, that’s the most important detail, and one that many people tend to overlook. 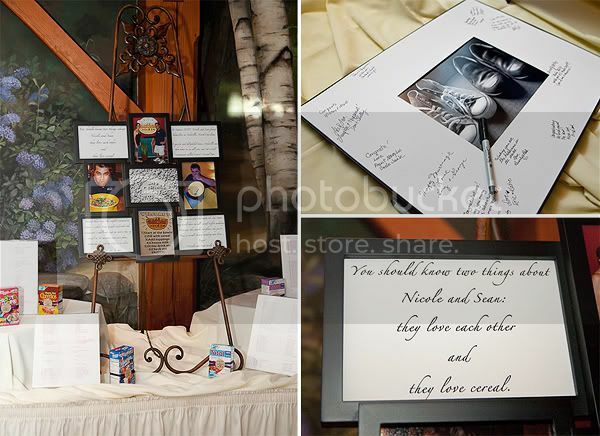 In order to keep to their budget the couple focused their efforts on DIY projects and as a result their wedding had a very personal touch. Because no one can say it better than she can, I’m going to let the Bride, Nicole, tell you about her wedding, and the planning that went into it! “In Summer 2007, Sean and I found ourselves in Asheville, NC. At the time, there was an all-you-can-eat cereal bar called Eaties (it has since closed) — which also ran cartoons all day. You could sit in their “living room” with your cereal and watch for hours. It was our kind of place. Sean and I love cereal… we pride ourselves on the number of varieties that are always stocked in our cabinets — breakfast cereal, snack cereal, hearty lunch or dinner cereal, dessert cereal, etc. We went to Eaties and Sean accepted their standing challenge: eat a whole box of cereal in 30 minutes or less and get a t-shirt as well as your name on their wall. He succeeded. After this experience, we decided that when the time came for us to get married, that we should have an all cereal wedding. And we envisioned giant bowls of cereal on a buffet table and reply cards where you chose your favorite milk variety rather than meal choice. But we soon talked ourselves out of this, realizing that no one who brought a gift would be pleased that in return we gave them cold cereal. So, instead we opted for a brunch buffet — a nice combination of hot and cold breakfast and lunch foods, which would satisfy us and, hopefully, our guests. This decision was one we made early — probably back in 2007, though weren’t engaged until 2009 — so this helped us to decide on a daytime wedding. That, and we’re not really night people, so we were thrilled with the idea of getting home in time for dinner afterward. 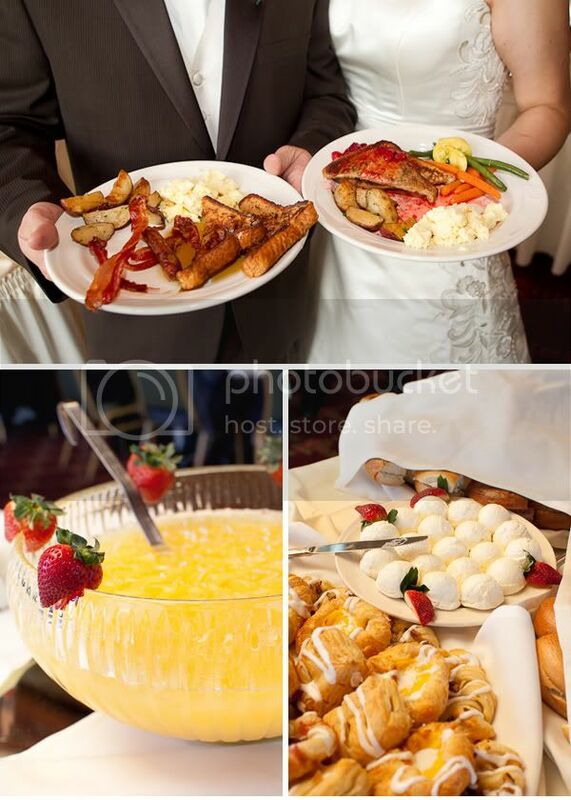 Having an 11am-4pm wedding is an immediate money saver. 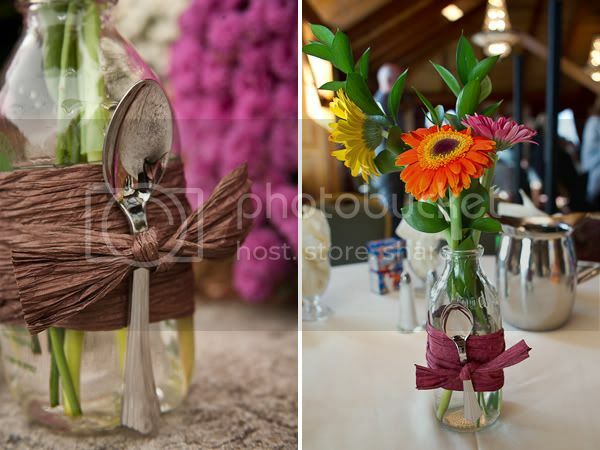 Centerpieces: My mom and I purchased milk bottles to use as vases from a local antique shop and a local farm. We tied them with twisted paper cord, which was both easier to work with and much cheaper than ribbon. We tucked a plastic spoon in each behind the bow — we used the plastic spoons that look like silver. Table Markers: We used names instead of numbers. We had seen online that people used different elements of their lives as table markers, so we decided again to stick with the theme. 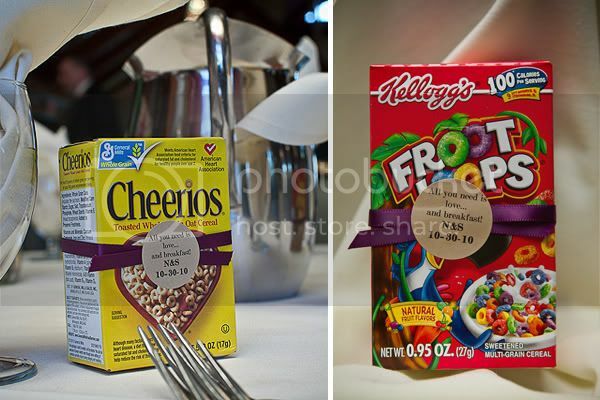 We used cereal names as table names (ex. Sean’s Irish family was seated at Lucky Charms). We didn’t know how to put them on the table, but I had been saving boxes since we got engaged, so we had over 30 varieties to choose from. In the end, we decided to go simple, and just put the boxes directly on the tables — instead of cutting or framing. We figured they would “set the table” with the milk bottles and spoons — for a well-balanced breakfast. We glued some of those glass stones in the bottom to keep them weighed down. 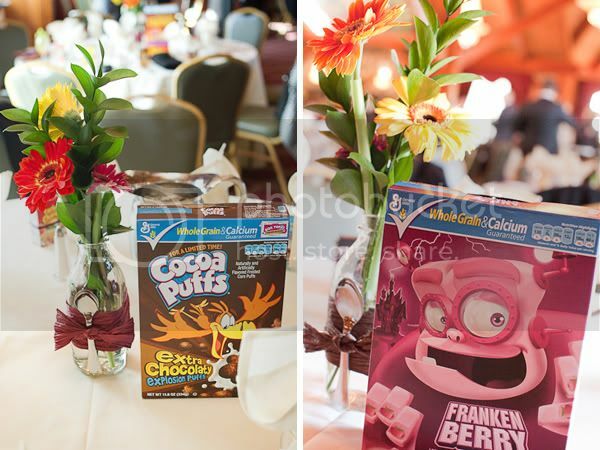 Favors: We used individual boxes of cereal. Funny thing is that these are actually harder to come by than probably anything else we used in the wedding! We got a variety of Kellogg’s and General Mills. We had leftover ribbon from our invitations and decided to wrap a piece around each. We used matching labels from our invitations that said “All you need is love… and breakfast!” with our initials and the date. We had a lot of elements that were very “us” in the wedding. Cereal was the main one and the one that was most obvious, but there were a couple of others. 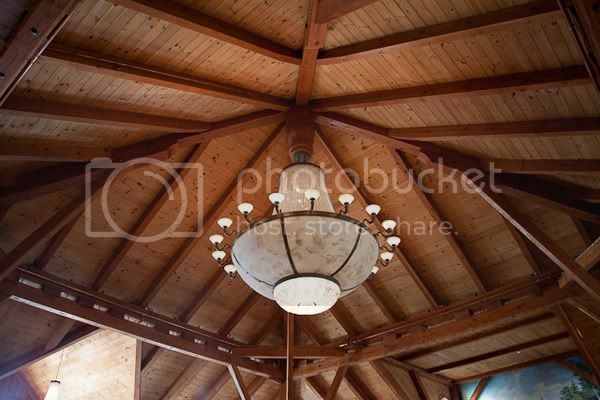 Venue: We knew we wanted a fall daytime wedding and we have very similar taste on environments that are attractive to us. We like rustic. We like old, colonial houses. We looked at a barn to have our reception in. In the end, we wanted something with a warm feel. The Tewksbury Country Club fit in our budget and in our vision. They have a “lodge” feel with a large fireplace, exposed beams, and cathedral ceilings. We fell in love with the look of the place. We have heard nothing but rave reviews from our guests. Flowers: We wanted seasonal flowers for environmental and budgetary reasons. Because we were using the milk bottles, we knew we didn’t need to fit in a ton of flowers. We opted for three colors of gerber daisies and some ruskus for greens. We picked the flowers up the morning before the wedding and did the cutting and arranging ourselves. Bridesmaid Dresses & Tuxes: I was never a girl who grew up with a vision of what my wedding should look like. This made it both easy and hard to deal with bridesmaid dresses. I have never been a matchy-matchy person. We found three strong colors that we all loved, that looked great together, and that were fall-ish. They were all shades of purple (a brownish one, a pinkish one, and a blueish one). Since there were three girls we also wanted three different styles — we went above-the-knee length, with varying necklines. Given the girls’ color scheme we opted to go with chocolate brown tuxedos instead of black. We found the perfect purple tie that incorporated a couple of shades. They were beautiful. Shoes: Sean and I are just about the same height, so I knew I would not be wearing heels on my wedding day. This was fine with me — I usually wear sneakers to work as it is… I love Converse! 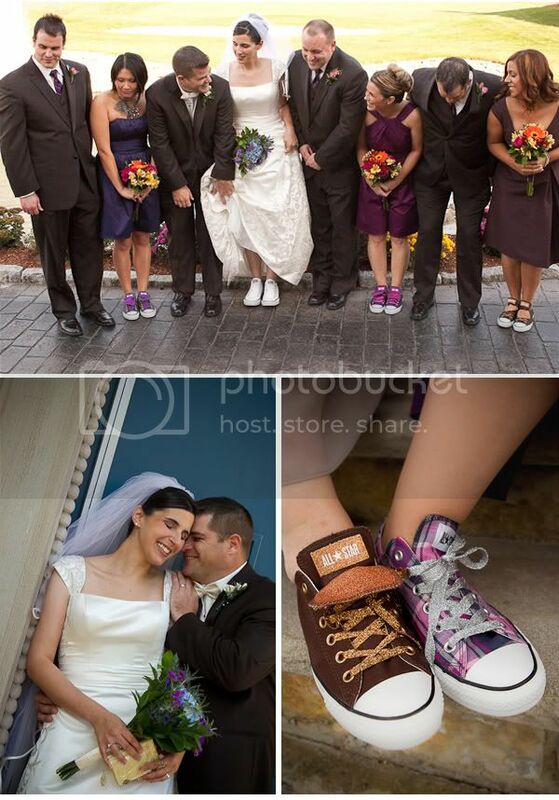 So, I told my bridesmaids we were going to wear Converse for the wedding. One of my bridesmaids and I went shopping in the mall one day and came across the shoes they ended up wearing — the colors were a perfect match, plus they sparkled, which we convinced ourselves made them “formal”. I didn’t find my shoes until a couple of months before the wedding. I went with sparkly white (though debated with having some custom made for a while). In the end, the ones I bought at the mall were a better match and less expensive than having them custom made. 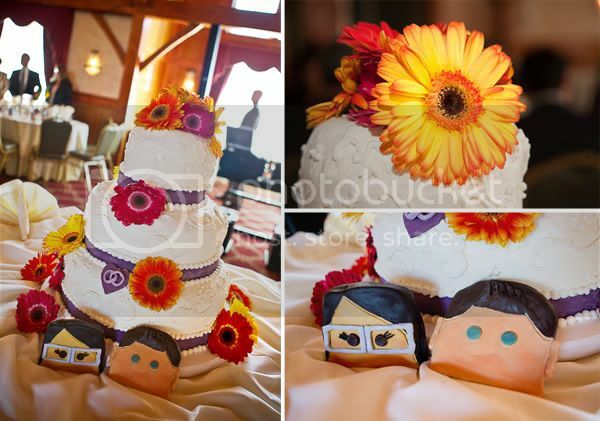 This fabulous wedding was sent to us by Amanda, of Boro: Creative Visions. A huge thank you to her, as well as Nicole for being so willing to share her story! I love how much personality this event had. It takes some bravery for a bride to think outside the box and follow her own road. It looks like they had so much fun and are very much in love. Congrats to them both! !